Oh, so that’s where it’s been hiding. Click Smart Controls (top) and then the Inspector (bottom); you might need to adjust a preference (below). GarageBand is a pretty amazing no-cost tool. You get a solid, reliable production app built on the same framework as Logic. It has loads of built-in sounds – instruments and loops. It has easy-to use but capable editing, complete with notation view. There’s now a virtual Drummer which can be fun for sketching out song ideas and backing tracks. And it’s very guitarist/instrumentalist friendly: there’s a big tuner (cough, Ableton), amps and effects. Just one problem: you might not immediately work out how to use third-party plug-ins. GarageBand 10 got rid of some features (including useful podcasting functions, unfortunately). It still works with AU plug-ins, but it’s harder to work out how – Apple has always sort of hidden this feature; not they’ve hidden it in a new way. I had sort of forgotten this happened until I had to try to see if GarageBand worked with Roland’s 64-bit, only-on-the-latest-OS Audio Unit plug-in build of the SH-101 PLUG-OUT. But it’s worth writing about this separately, because anyone with a Mac or who might need to advise a Mac-using friend ought to know this. 1. 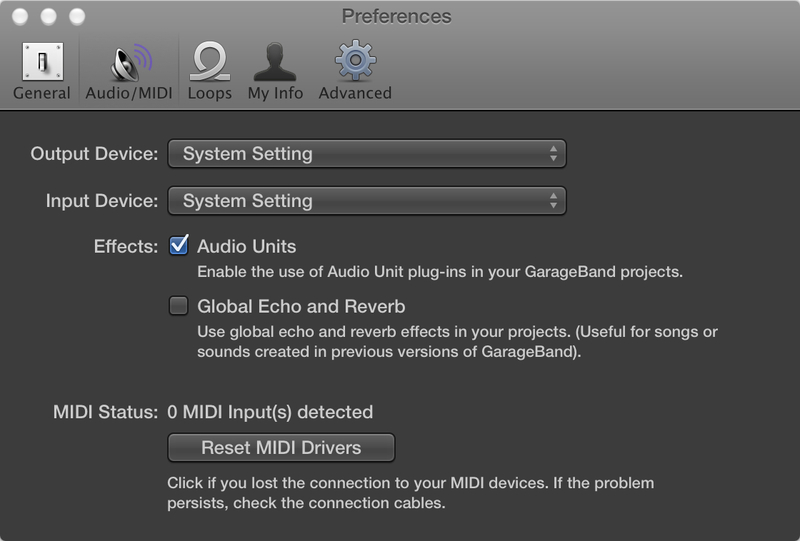 Choose GarageBand > Preferences…, then Audio/MIDI > Effects and ensure Audio units is checked. 3. 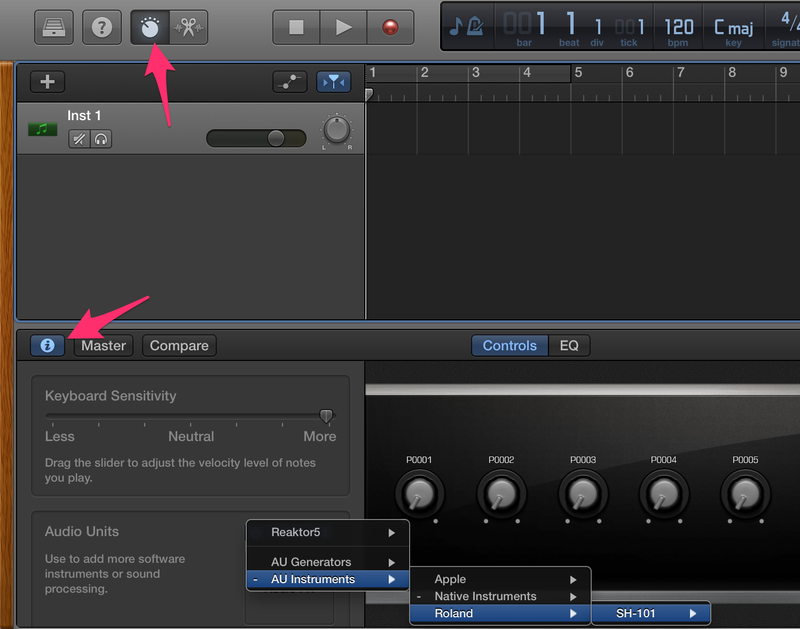 Select the track, and click the Smart Controls button on the toolbar (the one that looks like a knob – see picture). 5. Look for the Audio Units section – you may need to scroll or resize if it isn’t visible. 6. On the right, you’ll see areas labeled Instrument and Audio FX. Cool tip: you can use the Drummer automatic accompaniment feature to drive your own instruments. So you can take those patterns and feed them into a synth, for instance, for a very different effect. The same Instruments and FX sections are visible once you click the Inspector button. For effects, repeat the process for an Audio Track, and you can add effects to your instrument or mic. And that in turn comes from a must-read site if you want to learn more about all GarageBand can do. GarageBand isn’t a perfect DAW for every job, but it remains an important tool for beginning users and it can be useful to have in your arsenal if you have some spare disk space. (You can opt not to install all the third-party content or remove it after the fact.) If you’re using it and want to share how – or if you’ve got questions or tips – we’d love to hear from you. And today, we’ve learned that hiding things doesn’t necessarily make things easier or make for happier users.